Sorry about the headline. It’s actually not a sad story. It’s a re-birth. 23 years after Communicopia – then one of the world’s first digital media companies – opened its doors to serve the social change community, and five years after we stopped building websites to focus on digital strategy, we’re about to take the next big leap in our own evolutionary journey. We’re changing our name, our offering, and our thinking. Here’s why. Digital isn’t one thing. It’s everything. Like many of our peers, we started to notice a long time ago the consulting we did for social change institutions had relevance and ripples far beyond their digital strategy, programs, and teams. Digital was the way into a much bigger conversation about innovation, about where an organization was vital and growing and where it was weak, and what its staff, supporters, and political environment were asking (or screaming) at it to evolve to next in order to have more impact. We knew institutions that fully embraced more people-centric “web values” were doing substantially better organizing, engagement, and impact work than those that merely bolted a digital program onto the side of an otherwise unchanged system. We’re also adding some incredible senior strategists to our team with complimentary skills to my own and a long and successful track record of success. Stay tuned. What is it with those epic campaigns anyway? Then we noticed something else starting to clearly rock our world of changing the world. On and off over the past decade, bright lights of exciting new forms of impact blinked on, then seemed to disappear again. A whole new sector of “digital-first” online organizing groups took hold and grew exponentially across nearly every issue space, though it wasn’t always clear what relevance their petition-driven models had for the rest of the sector. We were involved with some exciting experiments in “networked” or “open” campaigns, but the model didn’t replicate. Then a client asked senior strategist Tom Liacas and myself to identify the top winning campaigns of the past few years, from across all issue and political sectors. We were to unpack their stories, understand their core innovations, and pattern match their internal best practices and tools. The results of this deep dive into nearly 50 case studies from today’s most successful campaigns – combined with our own extensive first hand experience – has led us to identify a new model of campaigning and organizing that we’re calling directed network campaigns. What’s a directed network campaign? Look no further than the four hottest movements of the moment: #Fight for 15 ($15 minimum wage), BlackLivesMatter, Keystone/Tar Sands/Climate, and Bernie Sanders. They all line up pretty much exactly with this new model. 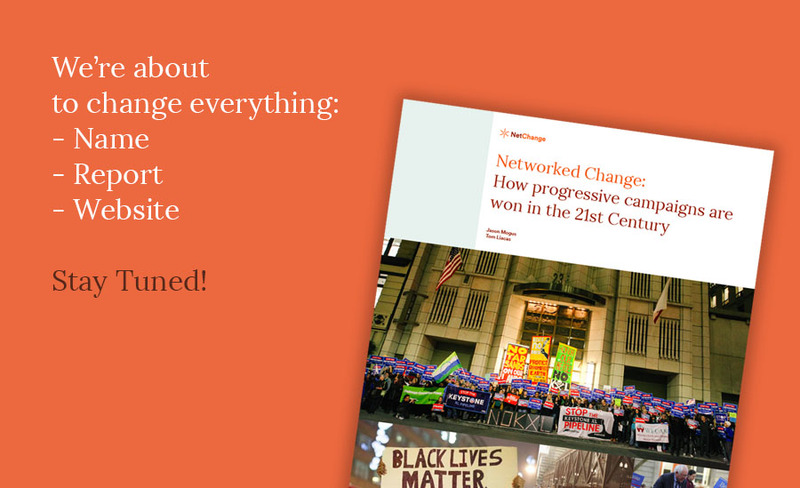 On June 10 we’ll be sharing our new report, Networked Change: How progressive campaigns are won in the 21st century, with the world. We couldn’t be more excited for the conversation we hope it starts. So why the new name then? We think it’s pretty cool that this new model for making big change lines up so well with our own personal interests, values, and highlight career experiences. And after twenty years of consulting, we know first hand how our work with organizational, campaign, and team change can transform dusty old institutions into more effective and successful networked movements. We’re so energized by this big idea we decided to change our whole company to focus on getting it out there! On June 1 we’ll be launching our new name, website, and social media channels. A week after that, at Personal Democracy Forum in New York, we’ll be sharing our Networked Change Report with the world, and it will be available for free download on our new site. As a subscriber, you’ll be the first to know. Thank you for being a friend of Communicopia over the years. I hope the changes ahead only deepen our relationship and our collective impact for the next two decades and beyond.